The water that is released from Lopez Lake flows into a stream. More than half of the water released downstream is used by farmers, said Mark Hutchinson, of San Luis Obispo County Public Works. Hutchinson said water flowing downstream recharges groundwater and keeps agriculture in business through the summer. He also said all of the cities that use surface water from Lopez Lake also rely on groundwater as a supplementary source. A minimum amount of water released from Lopez Lake must be kept in the creek for fish and wildlife, Hutchinson also said. 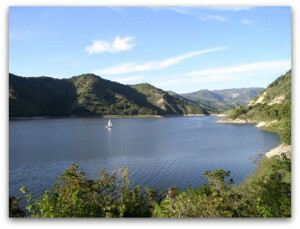 Lopez Lake currently contains 14,092 acre feet of water and is at 28.5 percent capacity. Last July, the lake fell to 26.4 percent capacity, or 13,087 acre-feet. Water levels declined further as the year progressed. In August, officials closed the boat launch ramp at Lopez Lake. The boat ramp has remained closed due to low water levels, even as rain has fallen this winter. Local fisherman Kenneth Whalen said boaters are upset that the ramp remains closed. As rain comes in, officials should let the lake level return to where it was previously, rather than wasting the water by sending it downstream, Whalen said. Public works officials also defend the practice of releasing water from the lake by saying it is done at Nacimiento Lake and Salinas Reservoir, as well. Additionally, public works officials say there are three streams which feed into Lopez Lake, and they are all currently running. I was down at the lake a couple of weeks ago, and there is mostly mud where the main boat ramp is located. I drove all the way down it, just because I could not believe my eyes at how little water is in the lake (especially the part near the tackleshop and boat ramp). Boaters can be upset, but I’d rather eat and drink than play on a boat, but I’m weird that way.